DUBAI, 30th December, 2017 (WAM) -- Investments at the R&D Centre in Mohammed bin Rashid Al Maktoum Solar Park will hit AED500 million by 2020, according to a press statement by the Dubai Electricity and Water Authority (DEWA). Saeed Mohammed Al Tayer, Managing Director and CEO of Dubai Electricity and Water Authority (DEWA) has visited the research and development (R&D) centre in Mohammed bin Rashid Al Maktoum Solar Park to have firsthand hand knowledge of the progress of DEWA’s vital projects. 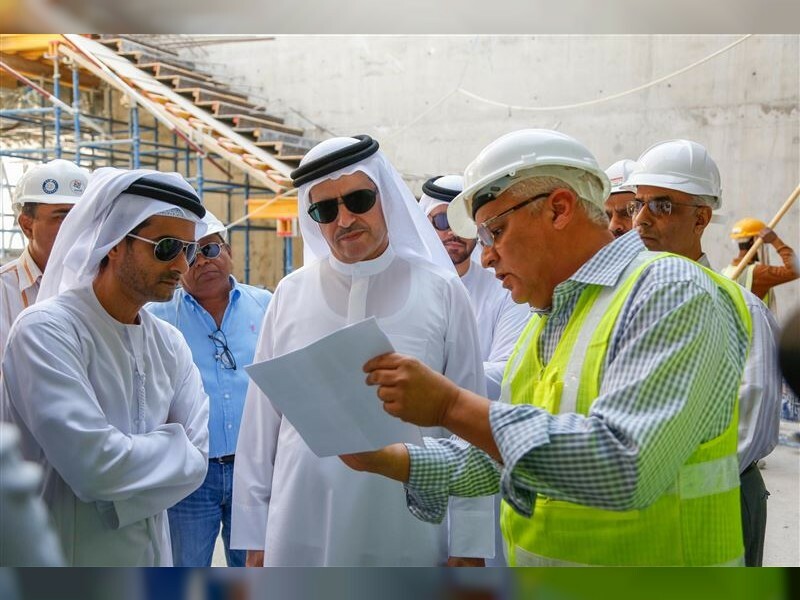 During the visit, Al Tayer was briefed on the progress of the R&D Centre, by representatives from Stantec International; the consulting company responsible for design and construction of the Centre. "The R&D Centre was launched in 2014, and focuses on four key operations. These include producing electricity using clean and solar energy, integration of smart grids, energy efficiency, and water. The investment towards the Centre will be reaching AED500 million by 2020. The infrastructure includes indoor laboratories, to study and test the reliability of systems, while outdoor laboratories conduct field tests and studies on mitigating the effects of dust on the performance of solar panels. This is part of DEWA’s efforts to promote the production of clean energy, and reduce operating costs," said the statement. The R&D centre aims to support Dubai’s position as a global hub for research and development in the field of solar energy, smart grids, energy and water efficiency, and capacity building in these sectors to enable Dubai to meet its sustainable development requirements. The Centre also supports DEWA’s vision to promote sustainability in energy supply, diversify energy sources, and create a business environment that encourages innovation by establishing a platform for creativity and innovation in the field of renewable energy, clean technologies and training national capabilities. The Centre’s facility comprises two sections with a total space of over 4400 square metres; the first part is dedicated for employees and staff and has two floors, while the second part is a single floor and is dedicated for laboratories. Integrated Photovoltaic Panels (BIPV) are currently being installed on the rooftop and outer walls of the Centre to produce electricity from clean solar energy. The laboratories in the centre will include the latest devices to conduct internal tests to analyse the efficiency of the photovoltaic panels and its accountability in the long run under local climate conditions. It also includes various labs and workshops such as electronic, mechanical and chemical labs. DEWA has signed agreements with several national entities, institutions, and companies, including the National Renewable Energy Laboratory (NREL) of the US Department of Energy, and the Spanish National Renewable Energy Centre (CENER) in R&D, and the latest developments in the fields of energy, water and the environment. DEWA is also collaborating with the United Arab Emirates University (UAEU), and Khalifa University, in the field of joint research and studies in renewable energy. Al Tayer inspected DEWA’s lab that was built using the 3D printing technology, within the R&D Centre. The lab is the first building in the UAE to be fully printed onsite, and the first such 3D-printed laboratory building in the world. The lab aims to study the science and technique of unmanned aerial vehicles (UAVs) and 3D-printing. The Electronics Lab will conduct electrical design and repair services for drones that can be used by R&D staff, and DEWA employees. The lab enables DEWA engineers to design and build customised circuits for different drone applications, and other innovative products, research, and educational solutions. The lab will solve issues and develop solutions to meet national objectives and DEWA’s requirements, and will run tests on avionic systems, flight controls, and electric power units. The Software Lab researches the design, implementation, analysis, and evaluation of aviation systems. Areas of interest include operating systems, mobile computing, cloud computing, virtualisation, distribution systems, and software engineering. DEWA uses 3D printing technology to develop spare parts that can be used to enhance efficiency of drones in maintenance and operational work. This serves the creativity and innovation strategy at DEWA, in cooperation with prestigious research centres and universities around the world. DEWA is also utilising 3D-printing and additive manufacturing, as innovative solutions for its internal printing operations for non-metal spare parts for equipment. This works to reduce procurement time and reduce costs, prolong the life of the equipment, and promote innovation at DEWA. DEWA is currently working on capacity building in 3D printing, by collaborating with leading organisations in applying 3D Printing in service organisations. DEWA focuses on utilising this technology to build spare parts for drones as well as tools for other projects including its solar energy projects.